This gleaming 2002 Royal Enfield looks like it stepped out of the 1960s. A remarkable Royal Enfield vintage custom motorcycle is for sale on CraigsList and eBay in North Carolina. 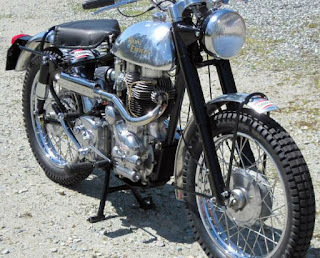 Unlike so many owners who want their Royal Enfields to look old-timey, this builder went to extraordinary lengths to reproduce a 2002 Royal Enfield trials/scrambler with exact details it might have displayed 60 years earlier. The more you look at this motorcycle the more you see. I was impressed by the conversion to right-shifting gearbox and replacement of the Royal Enfield nacelle with the older looking top yoke. These are big jobs and they make a big difference. High-mounted exhaust, right-shift, alloy tank and fenders, separate headlight. But with that done, what kind of person goes to the added trouble to make sure the grips say "Amal"? Dean Brevit was kind enough to explain his vision for the motorcycle. "I used to build bikes 35 years ago, mostly cafe racers and scramblers in the UK where I grew up (born here, grew up there, long story). Anyway, last year I was looking at what people were calling cafe racer and so on and they did not look like I remembered. Harley-Davidsons built to look like a cafe, left, and in flat-track style. "I thought I would build one or two as a winter project and to see if I could still do it. 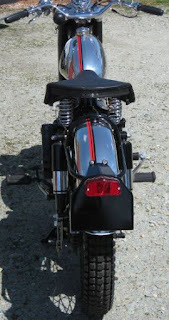 Harley was the easy choice as there are so many and it's a challenge to make a Sportster look correct (to me). "(My) black cafe racer was the first and the red flat track tribute was the second; now to the Enfield. "I wanted to build an old British cafe or dirt bike without having to much of a problem with parts. Enfield fit the bill as I'm very familiar with them (second bike I owned). 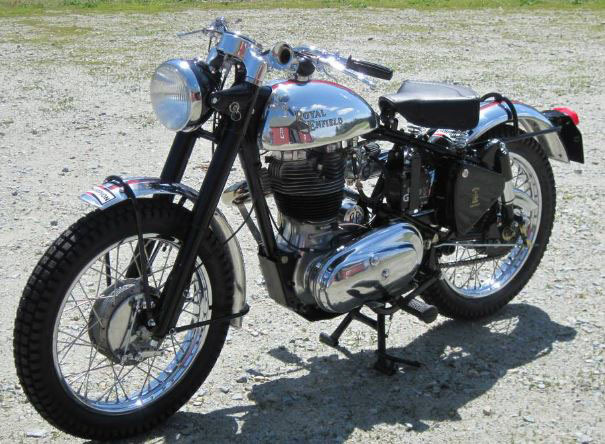 Buying an old Triumph or BSA was out: you ether get a basket case or an expensive stock bike. 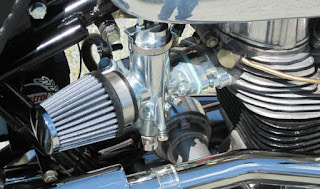 "Enfield on the other hand gets you an almost unchanged classic British bike platform all the way through June, 2002 (until electric start); nothing (better) replicates the valve clatter or exhaust tone of an old British bike. "I went with this style mostly because of ride position (cafe is hard on the back). I wanted it to be as correct as possible within reason. Top yoke and separate headlight are instantly noticeable. The bulb horn is not for show: it really is the only horn. "Headlight and top yoke are the first things that catch your eye if looking at an old bike. Some Enfields I've seen people leave the stock 55-plus street bike components in place. 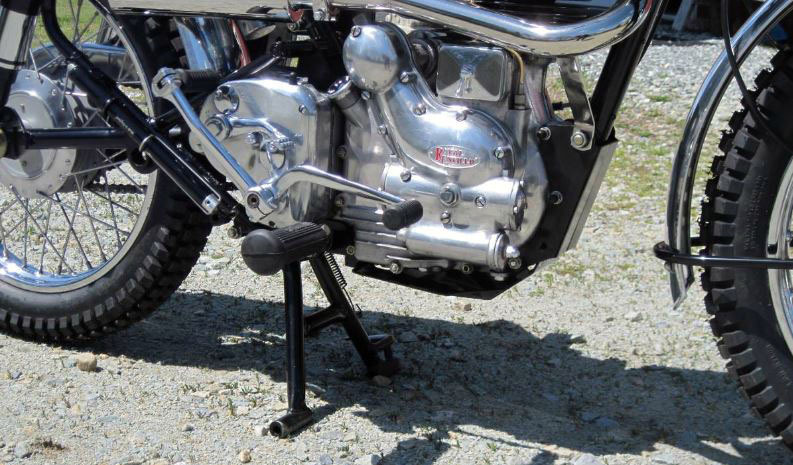 "No rubber bellows on the forks, as this was not done on the early off road bikes. Metal speedo drive was added also. Bars and original controls are a must but this creates some problems — you have to rewire the bike as there are no switches on the bars. The reg/rec and any other electrical items (not battery or coil) are in the tool box. Controls are as they might have been in the 1950s. This meant rewiring the motorcycle as there are no switches on the bars. "The (1950s-style flat-sided) tool box is one of the things coming out of India that need some quality control. I had to cut the lid off and reattach it to the stock box (nothing would have lined up). "On the other side of the bike is the air pump. Back in the day this was common. Enfield advertised the design of the rear end to allow easy access to the rear tire for repair; so you patch your tube and then what? Use the provided pump. This also works very well for off road as riders would lower tire pressure for the conditions. Who would have noticed if the grips had not been labelled AMAL? "Fenders, tires and tank are easy with only moderate fitting and adjusting. An AMAL carb is a must, ether concentric or monobloc. Now, if you are picky, this then pushes you to get the correct AMAL bar controls and grips (no short cuts). "What drove me to do the small things is exactly that people mostly just gloss over what they do today. I could not look at the bike and say "that looks good but..."
Carburetor is as shiny new looking as the rest of the motorcycle. "This brings us to the right-side shift, another must do. One it's correct, and two it gets rid of the horrendous cross over linkage. 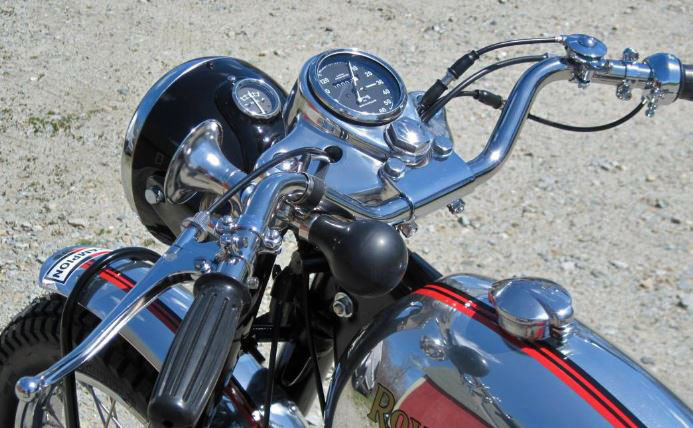 With shift on the designed side shifting is easy — you have to just gently tap the shifter." Dean's ad notes that "This bike is kick start only and is as close to a late '50s early '60s as you can get. Starts first kick, shifts smooth." Accept that this is still a 2002 Royal Enfield built in India and there is no pretension that it isn't. Its appearance has been altered, that's all; but in thoroughgoing fashion that makes it exceptional. Right shift and old-fashioned tire pump. 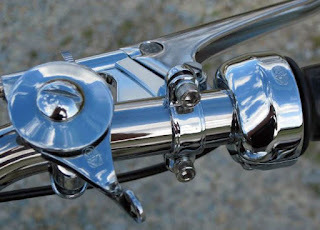 "Starting at the top, the top yoke was replaced for an aluminum late '50s type complete with correct stem nut and fork caps. Correct Smiths speedo and amp meter, metal speedo drive at wheel with grease fitting, late '50s headlight with light switch, late '50s headlight mount, late '50s bars. 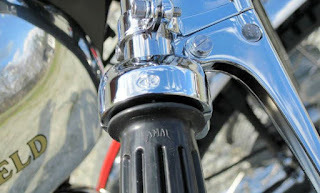 Levers are Amal, throttle housing and even the grips are Amal. New correct English cables, reproduction of original works aluminum gas tank with Monza cap, aluminum fenders with new braces front and rear, new high exhaust, new Armstrong shocks, late '50s battery holder, late '50s tool box with flat lid, new leather seat, new late '50s licence plate holder with Lucas light, metal '50s air pump, new small block tires. No more tombstone tail light. "New Amal monobloc carb, '50s tappet cover, right-side shift conversion done with sealed bearings, new shift lever along with rear brake lever, new late '50s large oval foot rests, factory works engine guard/strike plate (patterned from an original)." Here's a short video of the Royal Enfield running. Oh dear. As I received my second of five shipments of parts and components for four motorcycles coming out of Wisconsin Hibernation ranging through a 1968 Moto Guzzi V700, 1982 Kawasaki KZ305 CSR, 1985 Yamaha XV700 Virago and a 1997 Ducati M750 Monster, I am positively troubled by the fact that I may have a fifth reason to dip into my credit... VERY nice! Go for it, this bike needs nothing but riding , gives you something cool to ride while fixing the others.